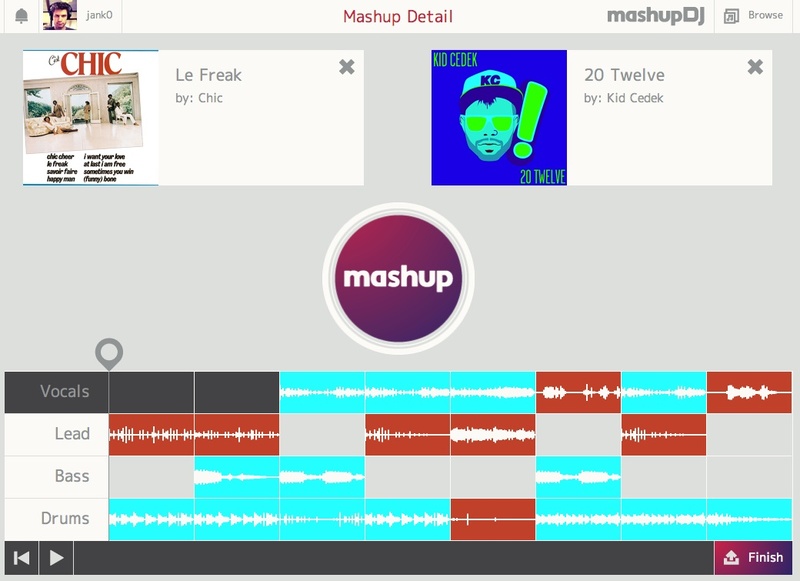 This is fun: The new online music app MashupDJ allows anyone to mix two songs together and create mashups based on popular tracks from artists like the New Kids on the Block, the Ramones and Devo. MashupDJ’s web app launched Tuesday, and the company is looking to launch an iPad app in the coming days. I had a chance to play with the MashupDJ web app a bit over the last few days, and have to say I liked what I saw. To get started, users have to select two so-called soundpacks that contain vocals, drums and other elements of the songs they want to remix. MashupDJ can then automatically create a mashup of those two songs with the press of a button, or users can start to manually arrange elements on a simple sequencer. Mind you, this isn’t a complicated music production environment – you won’t be able to adjust the volume of individual elements, and the resulting mashups can only be about one minute long. But it’s enough to toy around and have some fun (you can check out my own mashup here if you want to see what someone with very limited musical talent can do in a few minutes). Image courtesy of Flickr user robscomputer.